4 Shiitake mushrooms, 2 tbs of chopped onion, 3 tbs of shredded cheese, preferred amount of mayonnaise, soy sauce and REDMAMA. 1. Dust off Shiitake mushrooms with paper towel. Do not rinse them to avoid losing its delicate flavor. Cut hard tips off. 2. Toss chopped onions with preferred amount of mayonnaise and soy sauce. 3. Flip Shiitake mushrooms and put 2 on deeper dish part of each mushrooms. Sprinkle shredded cheese on top of each of them. Grill them in the oven until the cheese melt. 4. 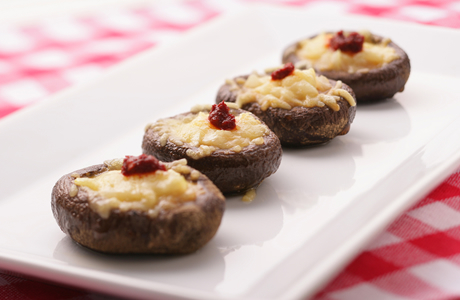 Place grilled mushrooms on the plate. Put a little amount of REDMAMA on top of each mushrooms.